Swiss percussionist Emil Bolli stopped by today for a visit. 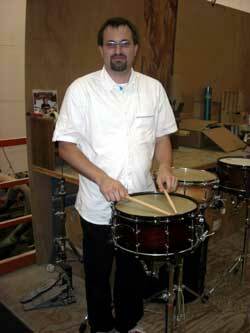 Emil is the owner of Murbach Music, a terrific percussion store located in Egeraingen, Switzerland. Emil came all the way to Boston so that he could check out our new Bronze-Pro Hammered Triangles, our new “X-Series” Synthetic Head Tambourines, plus many of our other products. Emil got an opportunity to play one of our new prototype snare drums. It’s a top secret project, currently reffered to as “G3”. Here, Emil is photographed with one of the new models. Stay tuned for more details about our new snare drums!